CONGRATULATIONS is in order to 15 students from our group of affiliate dojo’s in Massachusetts who received promotion this past Sunday. On May 17 2009, ranks ranging from Shodan to Renshi / Rokudan were awarded to well deserving candidates. Scoring was notably on the high side for several, showing an exceptional responsibility for self training taken …a key factor in staying focused and making progress in a lifetime endeavor. Karate is not simply a goal of achievement . All must be commended for A TON of hard work and self discipline. Improvement from the March pretest was significant across the board. Work is never done of course. There will be much to comment on when back on the dojo floors this week. 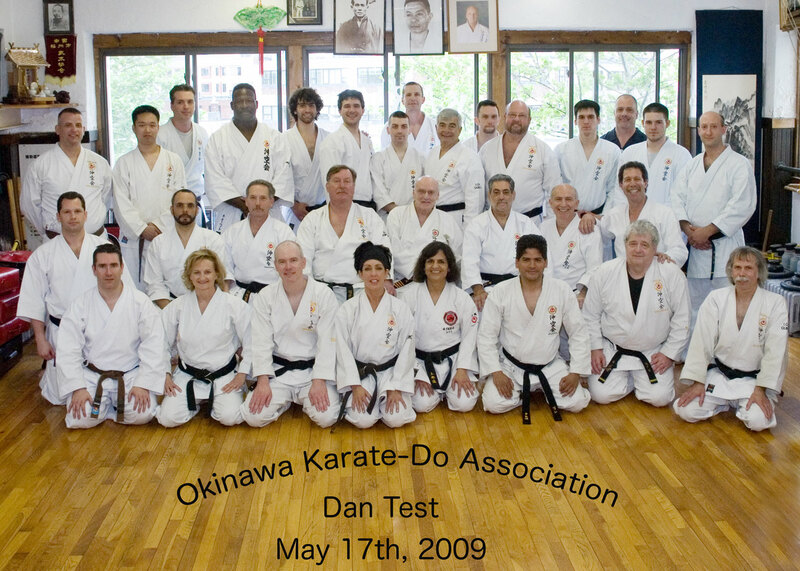 However, it was a standard setting test, successful in many ways; Spirit was very, very high in all present … hard work was evident in all …concern for technique even had some long time students on edge who were truly desiring to show improvement (4 candidates for 6th Dan over 50 years old!). The testing Board was also again overwhelmed by contributing teachers, giving rise to my thought this group has come a long way in solidifying a family approach to passing along the oral tradition of Shohei Ryu, our many esteemed instructors at Okikukai in Okinawa and the legacy of Master Uechi. All should be congratulated. Thank you to all the students from every dojo involved with this particular promotion for truly making teaching easy and the group of schools look great. Thank you to Gary as well for capturing one of the better post-promotion photo’s in a while, and for his hard work in putting together a video about Jack Summer’s lifetime of teaching (40 years since his Shodan Test!) that we all can’t wait to get a peak at! The pre-test will be on Sunday March 22nd and the promotional will be on Sunday May 17th. Your instructor will have the latest details. We are excited and anticipate a large turnout.